Although it still feels closer to winter than summer here in New York City, we are in the throes of late Spring, and 2017 is well under way. Given we are a third of the way through 2017, there is no longer an excuse not to be well informed about 2017 trends and styles. In contrast to the fashion choices of 2015 and 2016, 2017 has definitely been a unique year when it comes to popular fashion choices. 2016 was the year of over the knee boots, chokers, and velvet. 2017 is the year of onesies, patches, athleisure and much more. What used to be considered “out there” is now the normal. The challenging part is finding a way to adapt the 2017 “normal” looks to every day life such as school and work. Check out the styles to know below. Athletic wear has arrived on the fashion scene, and it doesn’t seem to be leaving any time soon. 2017 has taken the “yoga pants to work” trend and given it a new, more fashionable, flair. The fashion world has given into the fact that women refuse to be uncomfortable in their daily doings anymore. 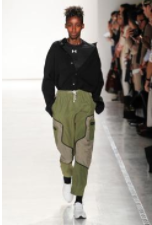 Instead of letting women of the world continue to look like their outfits were the same ones they slept in the night before, top designers are now taking athletic wear (the materials) and making it more fashionable. You can look good and feel good in 2017 apparently. The days of parents nagging their daughters to tuck in their bra straps are over. Bra straps now seem to be the main attraction of the outfits women are rocking in 2017. Bralettes are selling for $20-30 a pop, and they are seen as an accessory to any millennial summer outfit. For those who are incredibly fashion forward, some have started layering their bralettes outside of their shirts. While I have mainly witnessed this trend in Asia and Australia, that’s not to say this trend won’t be stopping over in the U.S. soon. Walk by any Urban Outfitters and a one piece jumpsuit will stare you down from the display window. These outfits remind me of a retro paint smock that Jackson Pollock would have worn to avoid damaging his clothing during the painting of “Autumn Rhythm.” However, fashion has decided that this is the new style for summer of 2017. While it may be okay to pull this look off up North where we max out at 80 on a normal summer day, there is no chance people down south would willingly partake in this style if they cared about their well being. Can you say hot? Girl scout vests meet fashion. 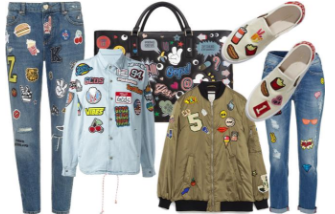 It is now decidedly okay to sew on patches to normal items of clothing such as jeans, shirts, sweatshirts, and even purses (I’m looking at you Coach). The patches designers are choosing range fromminiature dinosaurs to Southpark characters. The more “5-year-old” the patch looks, the more fashionable the piece is. I’m still deciding whether I like or hate this one, but everyone should beware from over investing in this trend, as it surely will be out of style a few years down the road. One thing I will say is that 2017 trends are perfect for celebrities and those working jobs that allow them to roam the streets during the day. For those of us living a slightly more corporate life, it is definitely tough to look “2017 fashionable” while still looking acceptable. 2017 has been a unique year for many reasons, and the fashion is certainly fitting into this theme as well. Do Pinehurst, NC Dentists Need a Website and Internet Marketing? | Will Hanging with Mr. Cooper Come to Netflix or Amazon Prime?